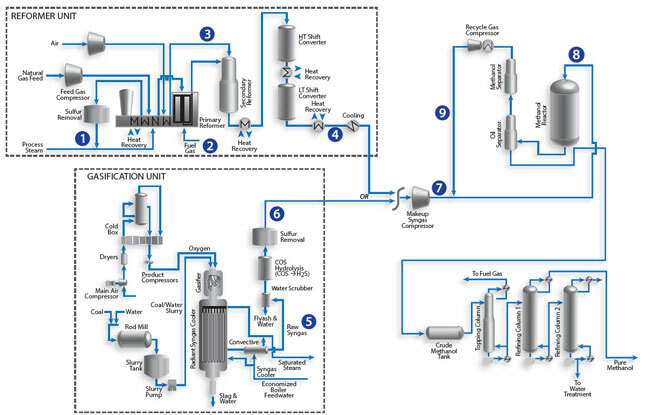 A typical modern methanol-producing plant based on natural gas as primary feedstock converts the natural gas in a Steam Methane Reformer (SMR) to make-up syngas, a mixture of H2, CO and CO2. Alternatively, the syngas can be produced via gasification of coal, petroleum coke, oil residues, or biomass. The raw syngas converted to methanol in a methanol synthesis loop. Methanol conversion is continuously removed from the synthesis loop in the methanol separator. The gas from the separator is then recycled back and combined with the make-up syngas as part of a synthesis loop. Many of the gas streams in the methanol synthesis process pose significant challenges for traditional analyzers. The Optograf™ Analyzer provides a unique and robust solution for these challenging streams.